Hey! I want to transfer my chats history on WhatsApp from an old iPhone to my new iPhone. But, I don't understand, how to transfer WhatsApp from iPhone to iPhone without iCloud? I'm not a tech savvy person and my iCloud is full with photos and I cannot use it to backup now. Please help! If you are wondering about transferring WhatsApp from iPhone to iPhone without using iCloud, then you have found the right place. Keep reading this article to understand the most effective solutions in terms of time efficiency, security and ease of use for your needs. To help you deal with the dilemma of how to transfer WhatsApp from iPhone to iPhone without iCloud, we've brought to you one of the most trusted program to serve the purpose. iMyFone D-Port Pro is a highly recommend tool that can effectively help you to transfer only WhatsApp from iPhone to iPhone as it can selectively backup and restore your device data in a few simple clicks. 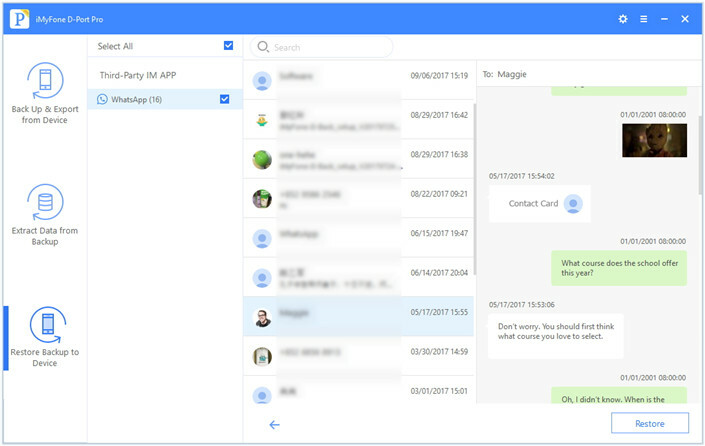 That means you can individually backup an app like WeChat, messages, or WhatsApp. 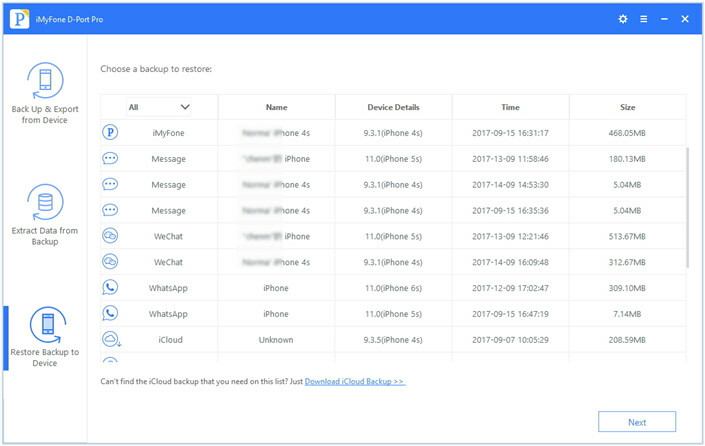 You can also resotre only WeChat, messages, or WhatsApp from your iTunes or iCloud backup without overwriting the other data on your iPhone. Below mentioned are two different situations in which iMyFone D-Port Pro can efficiently help you with your requirements. Let's get to know about it in detail. 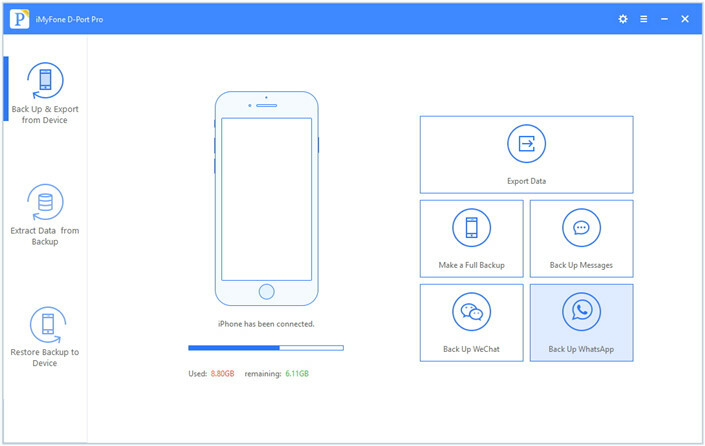 Assuming that you don't have any backup of your old iPhone, we will first backup WhatsApp separately using iMyFone D-Port Pro and then restore the backed up data to new iPhone. Step 1: Install and launch the latest version of iMyFone D-Port Pro on your computer and get your old iPhone connected through a lightning cable. Step 2: Once the device gets detected by the software, tap on 'Back Up & Export from Device' option from the left panel. Now, click on 'Back Up WhatsApp' to navigate to the next screen and then tap the 'Back Up' button. Step 3: Once the backup is done, disconnect the old iPhone and connect the new iPhone. Now, tap the 'Restore Backup to Device' option from the left panel and select the backup file you've just made from the list and hit 'Next'. Step 4: Tap the 'Next' button again on the upcoming screen to initiate scanning of the backup file's data. 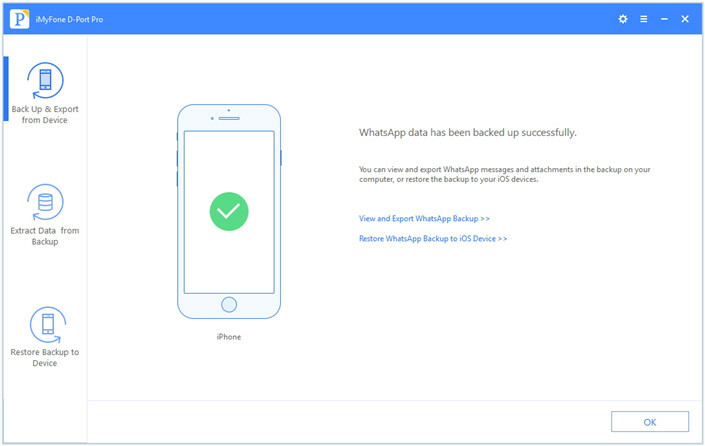 Step 5: Your WhatsApp data will then be displayed on the next page. Simply click 'Restore' and then tap 'Done' when the restore process is complete. In this scenario, as you already have an iTunes backup, you need to simply connect your new iPhone to the computer and follow the steps listed below.Actually, if you have an iCloud backup, you can also individually restore WhatsApp data from the backup using D-Port Pro. The steps are similar. Step 1: Launch iMyFone D-Port Pro and from the left panel, tap on 'Restore Backup to Device'. Step 2: Now, select the preferred iTunes backup and hit on 'Next'. You'll now be asked to either restore full backup or partial backup, tap 'Restore Partial Backup'. 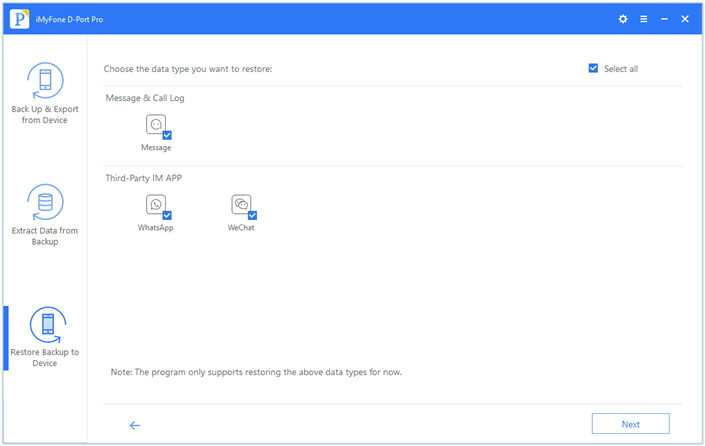 Step 3: From the upcoming screen, select the WhatsApp data type and tap 'Next'. The tool will start scanning the data and will make it available for preview on the next screen. 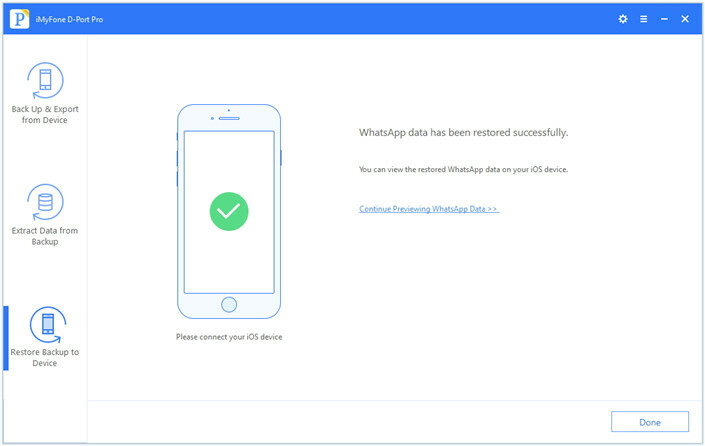 Step 4: Lastly, hit on 'Restore' to initiate restoration of WhatsApp data to your new iPhone. 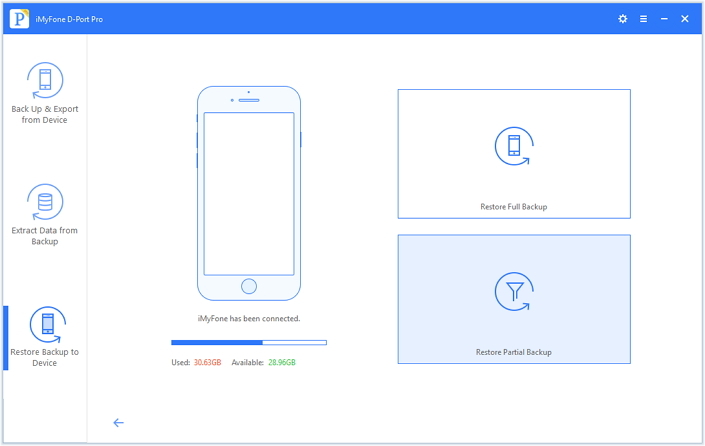 If you don't mind transferring all the data on your old iPhone to your new iPhone, you can also just backup your old iPhone and restore that backup to your new iPhone. The steps are very simple, but please note that the existing data on your new iPhone will be overwritten. 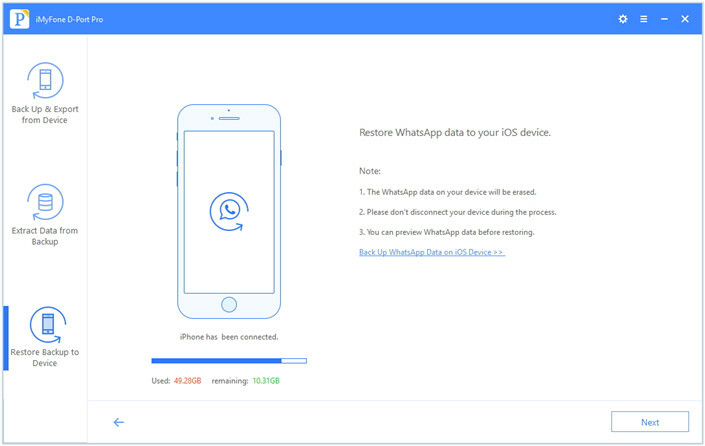 Here are the steps to transfer WhatsApp from iPhone to iPhone using iTunes. 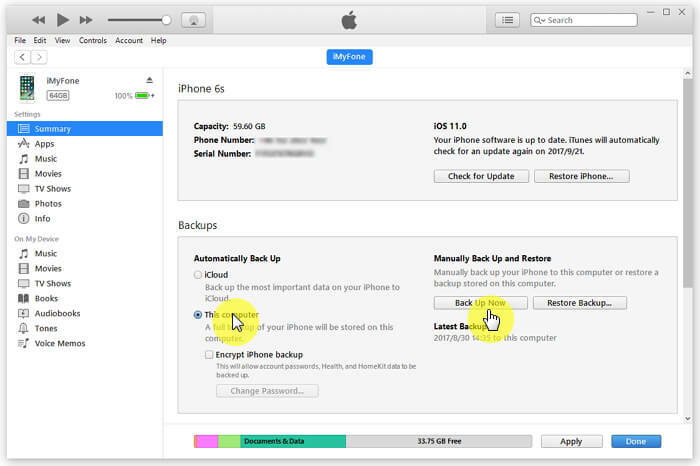 We are going to explain the backup process first and then the restoring part. Step 1: Get the iTunes on your computer updated to the latest version and then connect the old iPhone using a USB cable. Step 2: Now, tap on the device icon from top on the iTunes interface and go to 'Summary' tab. Step 3: Under the 'Backup' section, choose 'This computer' to backup the data and then click 'Back Up now'. Your old iPhone data will get backed up now. Step 4: Next, disconnect the iPhone and exit iTunes. Now, re-launch iTunes and connect your new iPhone to which you wish to restore the data and repeat the process till step 2. Step 5: Now, push the 'Restore Backup' button this time and then select the recent backup file from the drop down list. Lastly, tap 'Restore' and wait for the process to complete. Step 1: Launch WhatsApp on your iPhone and tap on a particular group or individual chat. Step 2: Go to the 'Group Info'/'Contact Info' by tapping the contact or group name at the top. Scroll down to find the 'Export Chat' option and click it. You'll now be asked to choose from 'Attach Media' or 'Without Media', select the one you prefer. Step 3: Lastly, you need to provide the recipient email ID and click 'Send'. 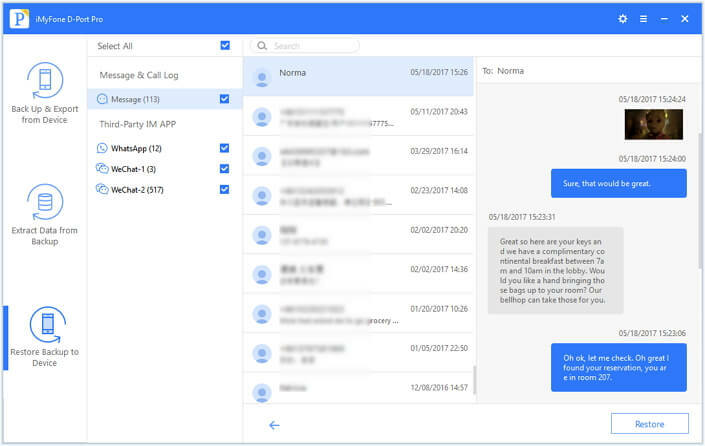 The mail body will contain a text file attachment of chat. Note: Emailing chats will only transfer WhatsApp in a text format for your preview but you cannot restore those chats to your new iPhone.